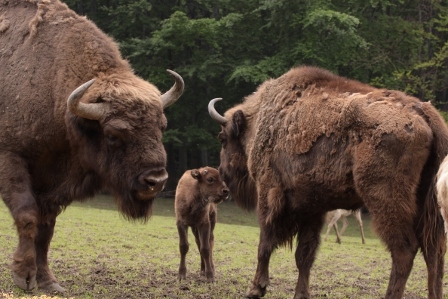 European bison (or wisent) (bison bonasus). It is the heaviest surviving wild land animal in Europe. Weights from 400 ( female) to 700 kg (males). The biggest one reach the 920 kg. Head is relatively large and heavy with a broad and rounded forehead, small eyes, short horns directed upward and curved inward. Neck is thick, short with a distinct dewlap.Front body looks very powerful because of highly-developed withers with chestnut-brown hair that is darker in winter than in summer.Coat in bottom of the head, back and neck is long, on the head, neck and hump are overgrown with mane. A characteristic feature of bulls is considerable disparity between the front and the rear of the body. Front cover is wide, massive, with a distinct hump, covered with long, shaggy mane. Back is relatively small, and covered with short hair. Wisents were hunted almost to extinction in the wild. 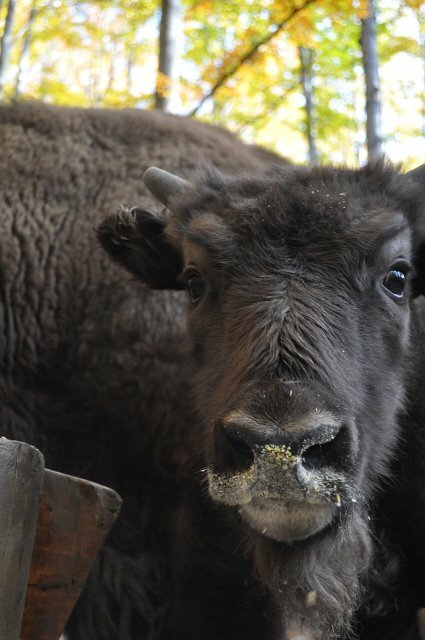 Currently the population of bison in the world there are about 4400 individuals, of which about 1200 are living in Poland. Diet typically consists of herbs, grass, bark, buds, tree and bush branches with leaves ( as hornbeam, birch, elm, raspberry fraxinus). Likes acorns and chestnuts. Adults receive from 30 to 45 kg of forage per day. Feeding in summer takes them 60% of the time, in winter only 30%. 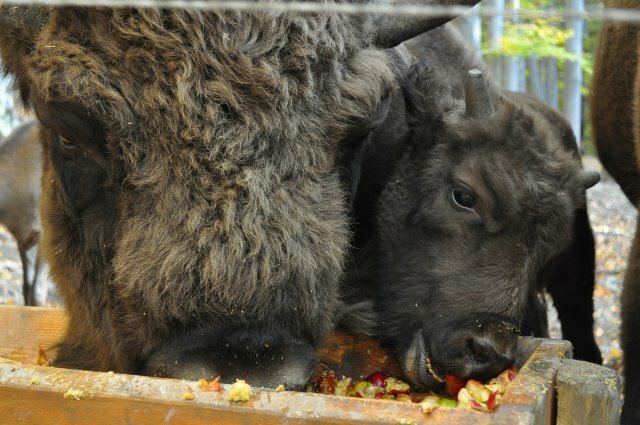 European bisons are usually slow animals, however, in case of emergency they can run at 50-60km per hour and jump over obstacles with a height of 180m. They are herd animals. They live in flocks of about 20 individuals. At the time of rutting season (August-September) they connect into larger herds. They reaches physical maturity relatively late, at the age of 8-9 years (males), 5-6 years old (females). Cows usually have a gestation period of 264 days, and typically give birth to one calf at a time. Mother takes care of the calf to the end of 2 years. Young after birth weight from 16 to 35 kg. children - Poziom (2012), Polonek (2011) and Podbeskidek (2010). Postron and Potworek already left the family nest. They are adults and do not live in Ustroń. Informal family member is also a red deer Groszek (Peas).